depending on the ground surface beneath. 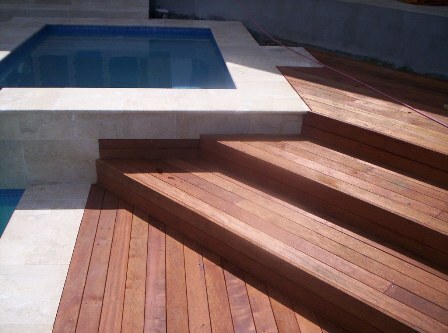 Some decks can be built straight onto concrete areas. instead of pulling up the old concrete the joists themselves can be connected to the concrete, even if the concrete is not lying level, the joists can be packed and bolted in a way to keep the decking itself level. First of all you need to set out your blob footings for your posts to sit in or on top of. Setting out the footing holes requires a spay can ground marker or just hit a stick into the ground where you dig. you need to determine where the posts to your deck will stand, along with how far the beams will span in between posts in order to hold the joists up and the live load that will be on top of the deck. If you know how to read timber span tables according to the Australian standards, then you will know what sectional size timbers to use. for large distances between posts ie 5.0 meters and over, it would be wise to have an engineer specify beam size dimensions. or use high span tables. Once your holes are dug, then its time to pour some concrete. Your hole depths should also be determined from what type of soil you have, common hole dimensions for blob footings are around 300mm wide x 450mm deep for 1.5 x 20kg bags of concrete per hole. Once your concrete is set you are able to place you posts styrips onto the footings by using galvanised dyna bolts. Alternatively the treated pine posts can be sunk into the wet concrete, making sure they are kept plumb upright. Once posts are ready you need to determine the top level of your decking ie, the finished height where you walk onto the deck from. Once your level is determined you know need to measure the height of your timber joists and beam (bearers) to mark where your beam will be bolted onto your posts. Once beams are in place your joists can be nailed in postition along your beams, generally 450mm centres apart. see span tables for joist dimensions. 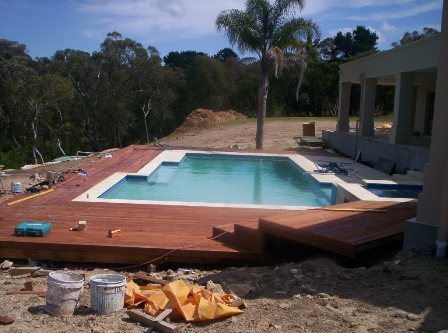 After you joists are in position and connected you decking can now be cut into place. most decking boards should have around a 2.5mm to 3mm gap between them, you can use a decking nail for this gap inbetween the boards. decking can be nailed by hand or a coil nail gun, these guns are for hire at most equipment hire companies.